Are the fish in Lake Nighthorse safe to eat? 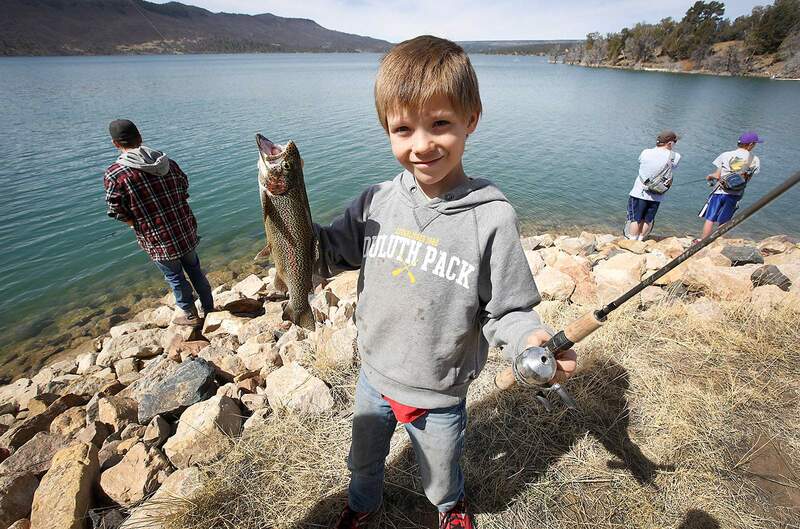 Clayton Morris, 8, of Redmesa, tries to reel in a rainbow trout during the “First to Fish” kids-only fishing event March 31 at Lake Nighthorse. 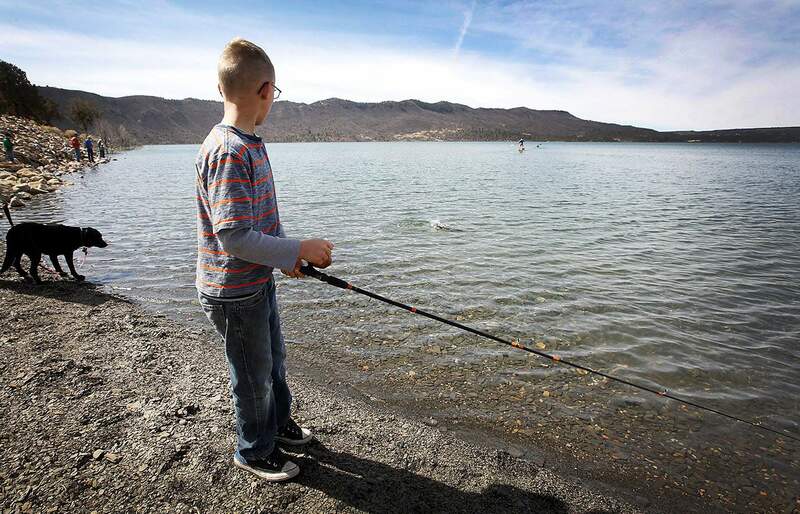 Health experts say fish in Lake Nighthorse are safe to eat. Because fish in Lake Nighthorse are stocked, biologist don’t believe fish there will bioaccumulate mercury like they do in other reservoirs around Southwest Colorado. With Lake Nighthorse now open to the public, many people discovering the new waterway in Durango want to know: Is it OK to eat the fish? The simple answer is yes, but a deeper look into the question proves it’s not a black-and-white issue, with many factors, such as what species of fish, what size and how often you eat them, muddying the waters. About 20 percent of Colorado lakes and reservoirs that have been tested contain mercury. And in Southwest Colorado, nearly all of the waterways have fish consumption advisories as a result of high levels of mercury found in fish. How mercury pollutesMercury is a highly toxic element found naturally in the environment, and in Colorado, it’s the most prevalent contaminate to fish, according to the Colorado Department of Public Health and Environment. How mercury pollutes waterways is varied, from natural events, such as forest fires and volcanic activity, to human-caused sources, such as coal-fired power plants, gold mining and chemical manufacturing. The shoreline around the boat ramp at Lake Nighthorse was full of anglers during the “First to Fish” kids-only fishing event. While traces of mercury have been found in fish in Lake Nighthorse, levels are not high enough to require a consumption advisory, as there are at other reservoirs in Southwest Colorado. Once mercury enters a lake, it works its way up the food chain. First, it infuses with plants and aquatic life like plankton and crayfish, which are then consumed by small fish, which are then eaten by even larger, predatory fish. Older, larger predatory fish, through this process of “bioaccumulation,” pose the greatest risk to human health, if consumed. These same fish may be safe to eat when they are younger and smaller. People who eat fish with high levels of mercury may have issues with developing nervous systems. Children and pregnant women are especially at risk. Safe for consumption?The Colorado Department of Public Health and Environment issues consumption advisories if levels of mercury from a sample of 10 fish exceed a concentration level of 0.3 parts per million. Guidelines for eating fish, which can be found on the department’s website, hold recommendations for different types of fish and how many times to eat them. At Vallecito Lake, for instance, consumption advisories are placed on northern pike and walleye fish. Women who are pregnant, nursing or plan on being pregnant are advised not to eat any walleye. Children 6 or younger are recommended to eat only one meal of northern pike a month. At Lake Nighthorse, however, it’s somewhat of a different story. 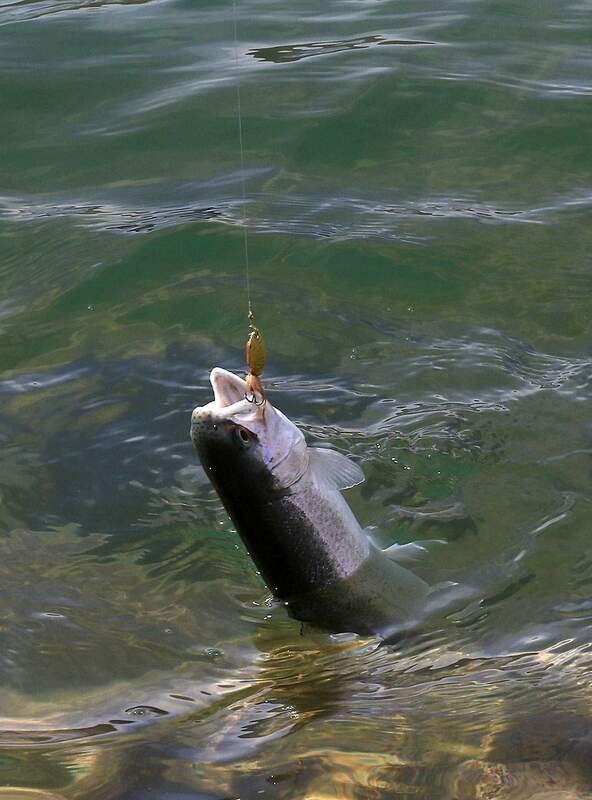 Rainbow trout and kokanee salmon from Lake Nighthorse tested in 2012-13 had an average level of mercury at 0.1 ppm, well below the state standard, said Kristy Richardson, a toxicologist for CDPHE. More concerning, though, is that samples from 10 rainbow trout taken in 2015 showed mercury levels increased to 0.2 ppm – a sign that fish at Lake Nighthorse may be bioaccumulating mercury. 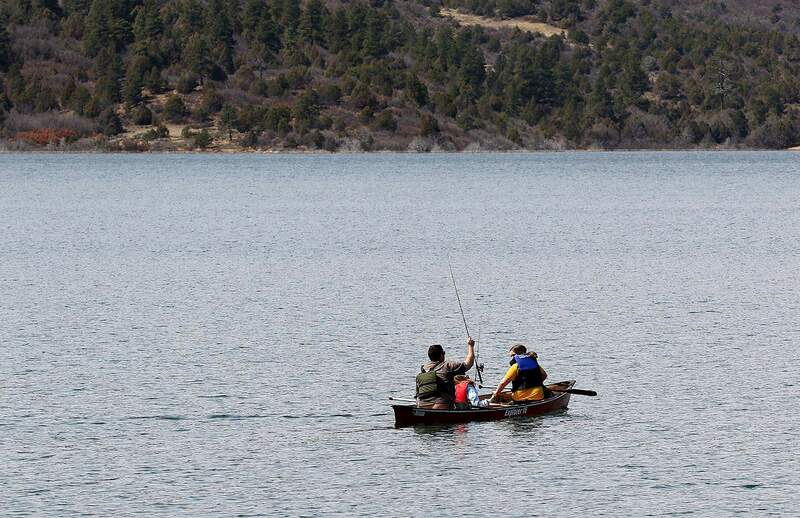 Canoes, kayaks and inflatable boats were being used during the “First to Fish” kids-only fishing event at Lake Nighthorse. Fish in Lake Nighthorse are tested for mercury, but so far, levels have not exceeded the threshold that would require consumption advisories. The Federal Drug Administration in 2012, for reference, found the average level of mercury in canned tuna was 0.35 ppm. The fish in NighthorseA little backstory goes a long way in understanding the issue. Water started filling up what would be Lake Nighthorse in 2008, with the reservoir considered full around 2011. It’s possible the fish in the lake haven’t been there long enough to absorb mercury, Richardson said. CPW’s White said the type of fish stocked at Lake Nighthorse – brown and rainbow trout and kokanee salmon – are rather low on the food chain and less at risk for mercury contamination, as opposed to northern pike and walleye. Plus, the fish that are put into the lake don’t live there all that long – about seven years at the most, White said. And, because trout and kokanee salmon need flowing water and a gravel substrate, the fish aren’t able to reproduce. Northern pike, on the other hand, feed on smaller fish and tend to live in lakes for about 20 years. It’s that combination of a long life and accumulating smaller species that make it prone to mercury contamination. About 50,000 rainbow trout, 20,000 brown trout and 120,000 kokanee salmon are stocked each year at Lake Nighthorse, White said. Though non-native species, such as white suckers, fathead minnows and johnny darters, have entered through the pump from the Animas River. While many anglers have pushed for CPW to pursue a trophy trout fishery for Lake Nighthorse, White said the lake isn’t supportive of such a designation. The lake has to be stocked to support fish. One other rumor to dispel: Lake Nighthorse is not affected by the uranium tailings that – while close by – do not drain into the waterway. The tailings are from the old uranium processing plant, not a uranium mine. Nicole Gordon, a spokeswoman for the U.S. Department of Energy, which oversees the Durango disposal site, said samples have proven the uranium tailings do not affect groundwater or surface water in regard to the lake. Gordon said samples are taken on a yearly basis. 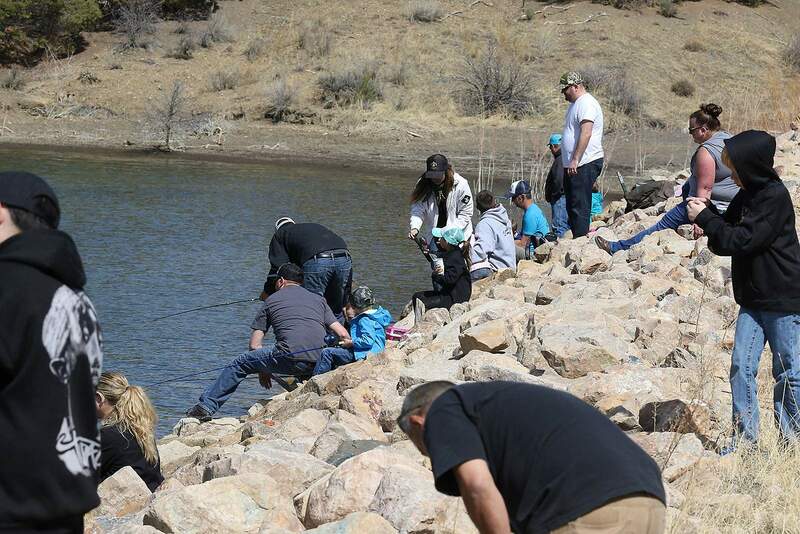 Positive reviewsCathy Metz, the city of Durango’s Parks and Recreation director, said she has heard positive reviews from anglers eating the fish at Lake Nighthorse since it opened on a weekend basis April 1. Damien Davin of Redmesa holds one a rainbow trout caught during the “First to Fish” kids-only fishing event at Lake Nighthorse. Damien is the son of Robert and Sasha Davin. Fish are unable to reproduce in Lake Nighthorse’s water, so they must be stocked on a yearly basis. The lake is now open seven days a week and will allow motorized boats beginning Saturday. Local anglers are taking a more cautionary approach. “Most of the fish there are planted, so I don’t see any reason why you shouldn’t eat those fish,” said John Flick, owner of Duranglers. “But when people say, ‘I want to keep a fish out of the Animas,’ I say I wouldn’t feed it to my kids. An earlier version of this story misspelled Durangler manager John Flick’s name.